Jumping while riding is a handy trick and it is inevitable that you will be asked to pop a wheelie. :) While you're riding along, get your pedals horizontal and then LAUNCH yourself upwards as high as you can. If you're lucky, the unicycle will come with you, and you will jump! It helps a lot to hang onto the seat as you jump. 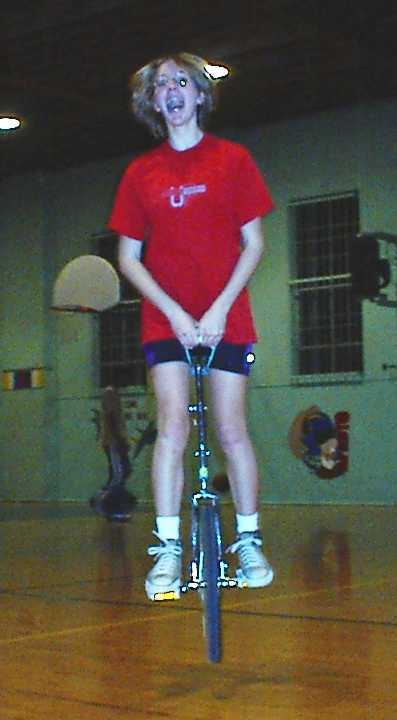 Keep the balls of your feet on the pedals and think pogostick. According to John Foss, jumping is actually the easiest thing you can do on a unicycle, even easier than riding! Another way to overcome objects is to ride over them rather than jump them. We can go charging up to a stack of two 2x4's and bump right over them. Four things to keep in mind: go fast, hold onto the seat, don't look down, and lean forward. Pop right over and keep on riding! One method of jumping is to jump with the seat in front. This enables you to jump higher. First be able to ride seat-in-front and idling in that position would help too. Then stop with your pedals horizontal and jump as you normally would! You can hang onto the seat with one or two hands. Next, learn to do hop-twists. These are useful for turning around using different skills. First learn to jump in a circle. Guide the seat, put weight on the pedals, and go for height. That way you have more time to twist in the air. Make your hop-twists bigger. Once you can do hop-twist 90s, go for 180s. For this, take a small hop in the direction you're turning and then take the big hop. Twist your body and the uni will follow!